It’s almost as big as my guitar! In response to small but non-negligible demand, I have produced a limited run of “El Demasiado” T-shirts. They are available for purchase at all future performances until they run out. 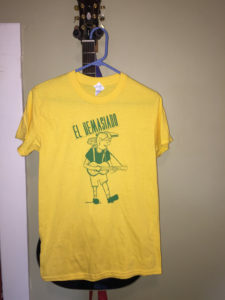 But if you don’t want to rely on mere luck to find me and buy a shirt in person, I have devised a new option: purchase on the one web site which has ALL the El Demasiado merchandise, i.e., the aforementioned T-shirt. I could be speaking only of store.eldemasiado.com. I unloaded quite a few shirts on tour, so inventory is dwindling. If you don’t want to miss out, act now! This entry was posted in News on November 20, 2015 by a one man band. The update is: tour is over! I played a bunch of shows, planned and unplanned, throughout New York City and New England. From the subway to the Black Fly Ball in Maine, I had a blast. It seemed impossible at first, because of the difficulty of transporting the drum kit, but in the end it all worked out. It’ll be a while yet, but I look forward to another tour in the future. And if you reached this site by way of the stickers and calling cards I handed out along the way… Hello, new friend! This entry was posted in News, Tour on August 21, 2015 by a one man band. I was playing at a bus stop in Portland (as “background atmosphere” in a friend’s movie) when the cameraman captured a quick ditty on my phone. It looks like it’s really going to happen: an El Demasiado tour of New England, plus some days in New York City. Except for a couple of planned appearances, it’s pretty much like Portland, in that I’ll just play somewhere and take my chances with the audience that happens by. If you happen to be nearby on any of these dates and you need directions to where I’m going to play, you should tweet at me. This entry was posted in News, Shows, Tour on August 5, 2015 by a one man band.